The border wall is now a MacGuffin, and that's the problem. A MacGuffin is a term of art in screenwriting. It's the thing the hero wants but the bad guys are trying to get, and therefore it drives the action of the story. In John Huston's "The Maltese Falcon," the Maltese Falcon is the MacGuffin. In "Raiders of the Lost Ark" it's the Ark. In "Dude, Where's My Car?" it's the car. The term -- though not the idea -- was reportedly coined by Angus McPhail, a screenwriter who worked with Alfred Hitchcock. But it was Hitchcock who popularized the term more than anyone else, even though his definition differed slightly from the conventional one. "The main thing I've learned over the years is that the MacGuffin is nothing," Hitchcock explained in a 1962 interview with French director Francois Truffault. "I'm convinced of this, but I find it very difficult to prove it to others." What Hitchcock meant is that the audience doesn't need to care about the MacGuffin. All the MacGuffin needs to do is justify the effort of the hero, and all the audience needs to do is care about the hero. Hitchcock cited his film "North by Northwest as proof of his point. In the film, Cary Grant isn't trying to get a Maltese Falcon; he's trying to find out what the spies want. "Here, you see, the MacGuffin has been boiled down to its purest expression: nothing at all!" The border wall isn't nothing, but in the context of the partisan fight over the shutdown, it might as well be. For those who see Donald Trump as the hero of the story, what really matters is that he triumphs. For those who see him as the villain, what really matters is that he be defeated. 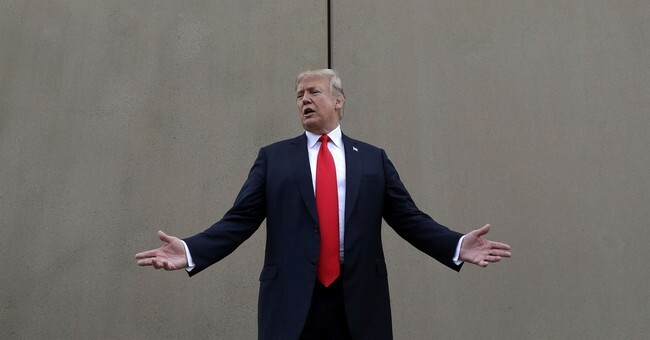 President Trump has been relentlessly upping the rhetorical stakes for the wall, making it sound as if America cannot long survive without one. That's nonsense. House Speaker Nancy Pelosi says a wall at the border would be an immorality. Logically, this is nonsense, too. There are walls there now. Does she want them torn down? Walls are inanimate objects, and whatever morality we ascribe to them is in accordance with their purpose. A scalpel is good when it is used to save a life; it is evil when it is used to take one. To compare -- as many have done -- a border wall designed to keep people out to the Berlin Wall, which was designed to keep people in, is an exercise in asininity. I'm reminded of my old boss William F. Buckley's demolition of such moral equivalence: "To say that the CIA and the KGB engage in similar practices is the equivalent of saying that the man who pushes an old lady into the path of a hurtling bus is not to be distinguished from the man who pushes an old lady out of the path of a hurtling bus: on the grounds that, after all, in both cases someone is pushing old ladies around." But this is what happens when you follow politics like it's a form of entertainment. If the rules of normal politics applied, there would be countless compromises available. And, if one is going to be objective, Trump has offered quite a few. He's not asking for the full price tag. He has said he's willing to make it more of a super-fence than the Mexico-paid-for concrete behemoth he promised on the campaign trail. There are other compromises most Republicans and Democrats could accept. Legalization for the "Dreamers" in exchange for a couple billion dollars in fencing would have been considered a huge win by liberals even a year ago. If Trump were willing to forgo the wall in exchange for enhanced E-verify and reforms to the legal immigration system, conservative immigration experts would cheer, at least in private. But if you follow these things like it's a movie, none of that works. If Humphry Bogart and Peter Lorre agreed to split ownership of the Maltese Falcon at the end of the movie, no one would leave the theaters happy.